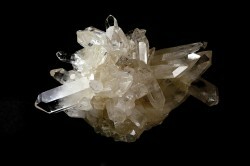 From gigantic and exotic cave formations to everyday ingredients such as salt and sugar, crystals are all around us. In our latest special exhibition – Crystals: Beauty, Science, Structure – we look at the history of the study of crystals, an endeavour which has prized their mysterious and natural beauty, as well as probed their fundamental atomic structures. In the middle ages, natural minerals were thought to carry occult properties, perhaps suggested by their startling array of colours and geometric forms. These regular forms promised a special insight into nature and from the 17th century onwards they were exactly measured and their symmetries exhaustively classified. At the turn of the 20th century even deeper secrets were illuminated by the ground-breaking technique of x-ray crystallography. Today, crystallography is the hidden science behind many aspects of our lives. This year, 2013, celebrates the centenary of the pioneering work of father and son William and Lawrence Bragg, which laid the foundations for the science of x-ray crystallography. The International Year of Crystallography takes place during 2014. Crystals: Beauty, Science, Structure is a collaborative exhibition which presents objects and ideas from the long history of crystallography. It draws on the Museum’s own collection and from Oxford University’s Department of Physics and its Museum of Natural History.